Everywhere. Everyone. Families and communities—whether urban, suburban or rural—have felt the sting of the opioid epidemic. Individual states began declared public health emergencies ahead of the recent national public health emergency declared by the US government in fall 2017. 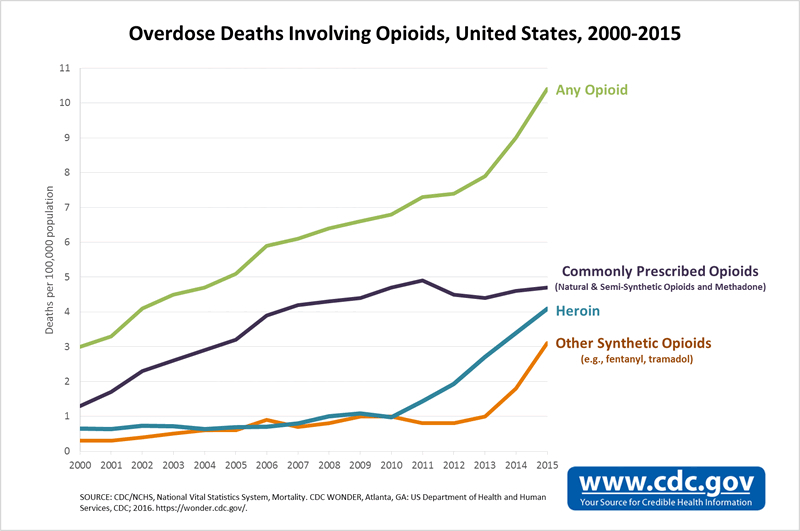 The alarming escalation of addiction, overdose and death related to prescribed opioids such as OxyContin, Vicodin and methadone can be traced back to the 1990’s when pharmaceutical companies assured physicians that opioid use would not lead to dependence. Believing that the risk of addiction was low, healthcare providers began increasingly prescribing opioid medications for acute and chronic pain. The CDC reports that the sale of opioid medications nearly quadrupled from 1999 to 2014. The problem continues today, with these highly addictive drugs still being prescribed to patients all over the US. In 2015 the CDC estimated that 2 million people struggled with dependence on prescribed opioid medications. The truth is anyone who takes opioids can become addicted to them. Opioids affect nerve cells in the body and brain, reducing pain and creating a feeling of euphoria. They are often prescribed after surgery, severe injury or for chronic pain. Side effects include depression, confusion, sleepiness, dizziness, nausea & constipation. Prolonged use leads to tolerance, with the patient needed more and more to get relief from pain. At higher doses suppressed breathing occurs and can lead to death. Abruptly stopping opioids leaves patients with severe withdrawal symptoms including nausea, vomiting, chills, rapid heart rate and fever. Temporary relief from these symptoms comes by taking opioids again…and again…and again, this is when use becomes addiction. For those using opioids to manage chronic pain the National Institute on Drug Use estimates that 21-29% of patients misuse the drug. Another danger comes from overlapping prescriptions. Patients are sometimes prescribed benzodiazepines along with opioids. This is a lethal combination. Benzos such as Xanax and Valium have a sedative effect on the nervous system and are used to treat anxiety, insomnia and seizures. The risk of overdose when using opioids and benzos together is very high due to impaired motor function and suppressed breathing. Diversion refers to the theft, robbery and illegal distribution of prescription medication. Diversion can be as simple as a family member sneaking a few pills out of a patient’s bottle or as complex as organized crime groups moving large quantities of stolen medication. Sometimes unethical doctors and physicians sell the drugs illegally. Similarly, individuals sometimes sell their pills. Medical facilities, pharmacies and distributors are the targets of theft and robbery, either by employees or others. Another way that prescription drugs find their way to the streets is through individuals who ‘doctor shop’ getting multiple prescriptions from multiple doctors. Opioids can be dangerous enough when monitored by a doctor, but can prove even more problematic and lethal when distributed with no medical care whatsoever. Many people addicted to heroin first abused pain pills. Astoundingly, in the US nearly a quarter billion prescriptions for opioids were written in 2013 alone. The prescription rate varied wildly from state to state. A CDC report found that providers in Alabama wrote three times as many prescriptions per person compared to Hawaii, with no correlating differences in the health of the two states’ populations. The discrepancy could be an indicator of illegal diversion of drugs, combined with overprescribing. So what is being done to combat this epidemic? Massachusetts was the first state to declare a public health emergency in 2014, allocating money and resources to seek solutions. In Maine, the state has set limits on the strength and number of pills that can be prescribed by doctors. Doctors and surgeons at Michigan University Hospital have sought to evaluate ways to manage pain with lower-strength pain pills and fewer pills, personalizing the dosage. They found that patients were often over prescribed medication following surgery. Patients across the nation are often given too many pills that are much stronger than necessary. Additionally, medical professionals at the university educate patients on the usage and risks of opioids and provide alternative resources. The CDC would like to see more oversight of opioid distribution, including restrictions on pharmaceutical companies supplying doctors and clinics known to be violating laws. FDA warning labels have been added to the boxes of both highlighting the drug interaction dangers of opioids and benzodiazepines. Walmart recently began offering disposal kits to safely dispose of unused pills, decreasing the chance they will end up in the hands of others.